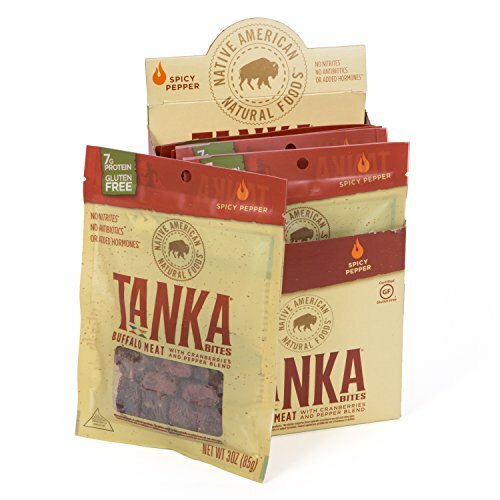 A great alternative to the usual processed beef jerky, Tanka Spicy Pepper Bites are made from whole foods ingredients including tart-sweet cranberries and prairie-raised buffalo. Our Tanka Bites Spicy Pepper Blend feature 3 ounces of bite-size buffalo and cranberry nuggets in a resealable package. Smoky and spicy-sweet with a special blend of jalapenos, habaneros, red and black pepper, Tanka Bites Spicy are the perfect way to enjoy some bison goodness with your family and friends. Based on a traditional Lakota recipe for wasna or pemmican, Tanka Bites Spicy are 100% natural and only 70 calories per serving. More tender and moist than beef or bison jerky, Tanka Bites are a gluten-free, nitrites-free, MSG-free, hormone-free, dairy-free, soy-free, high protein and low-fat healthy snack. Throw these low carb, healthy snacks in your purse, your backpack or your saddlebag to enjoy on the trail. Tanka Bites Spicy are authentic Native American food and deliciously suited for nearly every diet lifestyle.